This easy Chicken Pad Thai recipe from scratch makes a simple 30 minute weeknight meal. It’s packed with spicy Thai flavors and lots of peanuts. I learnt how to make this SIMPLE chicken Pad Thai from scratch in college. I realized in my second year that I was spending so much money on Thai take out food that it was time to get a little smart. 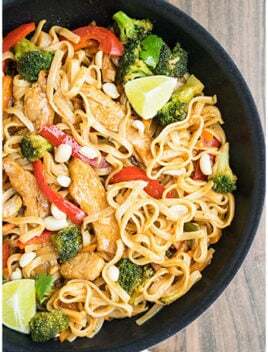 After trying a few recipes from various cookbooks and online, I mixed and matched what suited my preference and that’s how this recipe for chicken Pad Thai for BEGINNERS came to be. 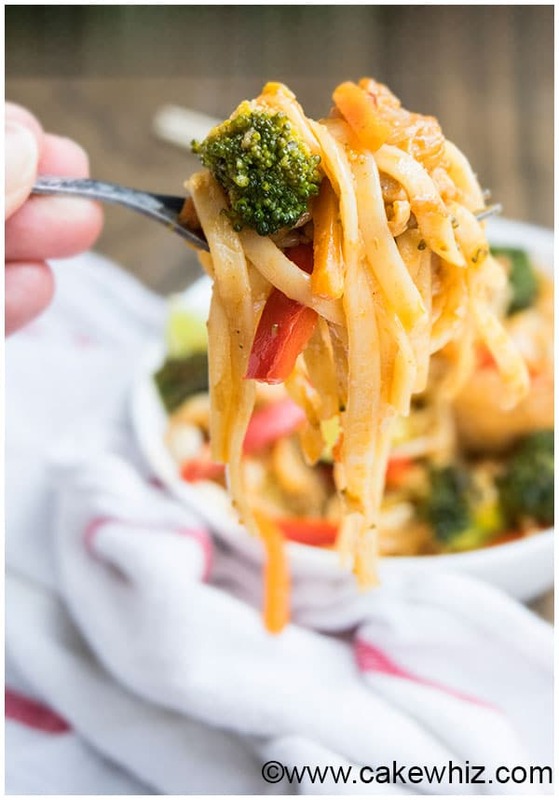 I am not sure if this is an AUTHENTIC chicken Pad Thai recipe but it tastes very similar to what I used to order from my favorite Thai restaurant. I have made this Thai recipe with ramen noodles, udon noodles, daikon noodles but honestly, I always come back to chicken Pad Thai with rice noodles since it tastes the best. A few weeks ago, I even made chicken pad thai with zoodless/ zucchini noodles and it was awful and I really DON’T recommend it! Yuck! I also tried a healthy Pad Thai recipe at a friend’s place and I am sure it was lower in calories but it just did not taste the same. DO NOT make any omissions and substitutions in the ingredient list because the flavor will change. Rice noodles, fish sauce, oyster sauce, tamarind paste, Thai red chilli sauce (Sambal Oelek) can be found in Asian stores or in the Asian aisle of some grocery stores. The level of spice can be adjusted, based on your PREFERENCE. 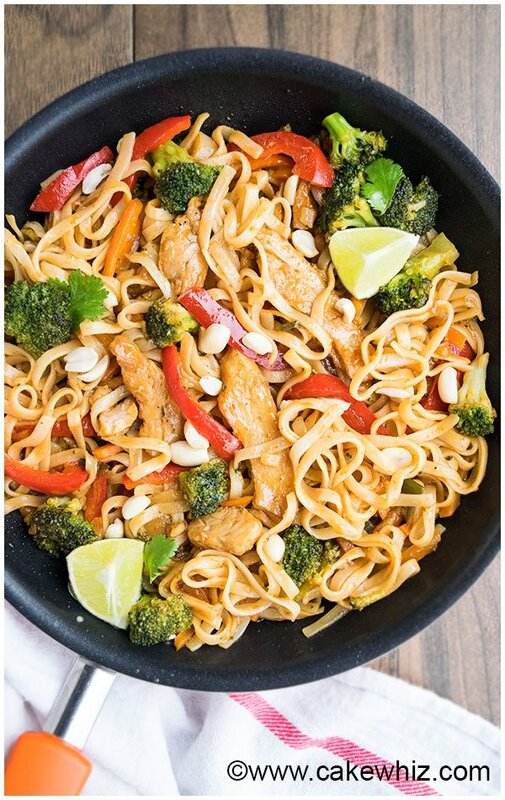 A friend of mine likes to make chicken Pad Thai with coconut milk and says it helps to cut the spiciness, which is pretty smart. She use the same ingredients I use for the sauce but also adds a 1/4 cup coconut milk in the sauce. Make MEATLESS Pad Thai by replacing chicken with tofu or soy chunks. DON’T make chicken Pad Thai with spaghetti noodles! You must use rice noodles to get the authentic Thai flavor and texture. If you are short on time, you can easily use frozen vegetables. Don’t forget to DRY ROAST the peanuts since it enhances the flavor. If you like Pad Thai noodles with a lot of sauce, DOUBLE the sauce recipe and mix in as much as you like in the rice noodles. How do you make Pad Thai? How do you cook Pad Thai noodles? The process is very simple and makes an easy 30 minute meal. First, boil the rice noodles and keep that aside. Prepare the Pad Thai sauce by mixing together all the ingredients in a small bowl. Keep this aside too. Then, cook the chicken, shallots, ginger and garlic in a non stick skillet or wok. Add the vegetables and stir fry them. Move them to the side and scramble an egg in the remaining space. Add the boiled noodles, some lime juice and the sauce you made earlier. Mix everything together and cook until the sauce thickens. Garnish with lots of peanuts, cilantro and enjoy! What ingredients are in Pad Thai? How do you cook tofu for Pad Thai? Stir fry tofu in a little bit of sesame oil in a separate pan and then mix it into the noodles at the very end. What is a good substitute for fish sauce? Can you substitute soy sauce for fish sauce? Can you use oyster sauce instead of fish sauce? I highly recommend using fish sauce in this recipe but I have heard that some people replace it with a combination of soy sauce and Worcestershire sauce. What is a good substitute for tamarind concentrate/ paste/ sauce? Some people suggest using lime juice or rice vinegar but I don’t recommend it since tamarind paste has a special flavor that you can’t find in limes or vinegar. In general, Thai food has a spicy kick to it but you can easily adjust the level of spice, based on your preference. What is is Pad Thai sauce? How do you make Pad Thai sauce? This sauce is sweet, tangy and slightly spicy that gives Pad Thai noodles its truly unique flavor. It’s made with tamarind concentrate, fish sauce, oyster sauce, red chilli sauce and brown sugar. What vegetables can you put in Pad Thai? How does Pad Thai taste like? What does chicken Pad Thai taste like? It’s sweet, tangy and spicy with a crunch that comes from roasted peanuts. How long is chicken Pad Thai good for? How to store chicken Pad Thai? How to reheat chicken Pad Thai? It tastes best when served fresh. However, you can store leftovers in a sealed container in the fridge for up to 2 days. You can easily reheat in the microwave or the stovetop with a splash of water. 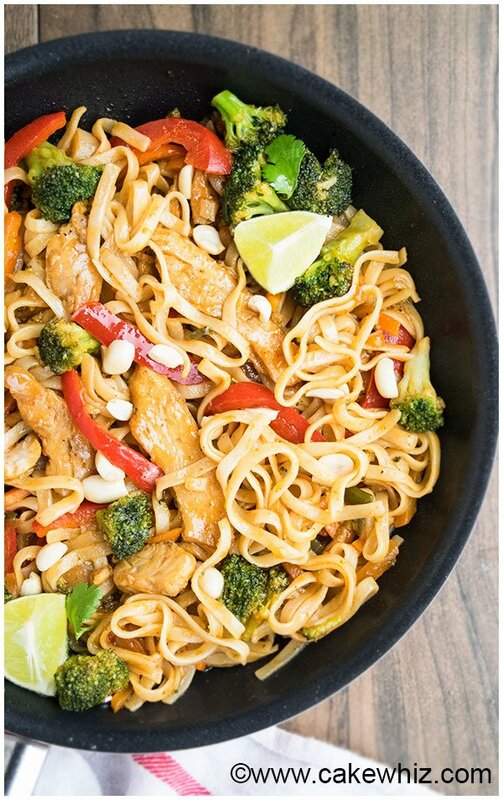 How to make chicken Pad Thai with peanut sauce? Based on all my research and the recipes I have tried, there is no peanut sauce or peanut butter in Pad Thai. Instead, there are lots of roasted peanuts in this recipe that gives it a crunchy texture. 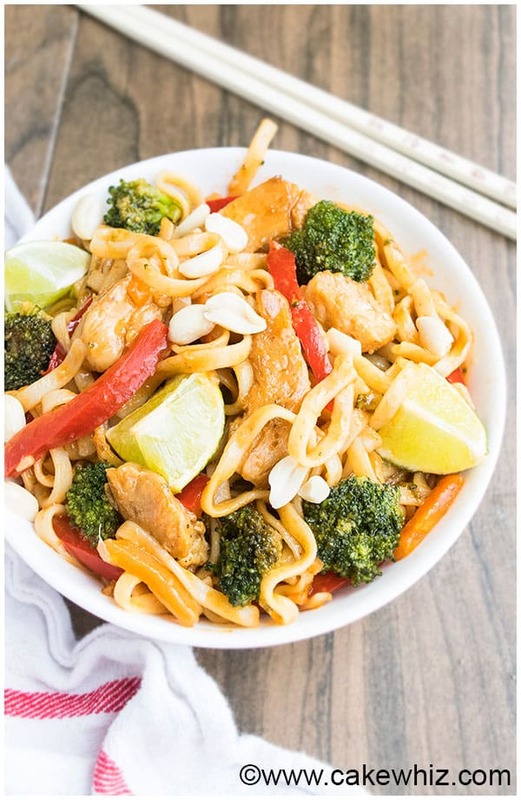 This easy Chicken Pad Thai recipe from scratch makes a simple 30 minute weeknight meal. It's packed with spicy Thai flavors and lots of peanuts. Prepare the noodles, according to the box instructions and keep aside. While the noodles were boiling, make the Pad Thai sauce. In a mixing bowl, add the tamarind concentrate, fish sauce, oyster sauce, red chilli sauce, brown sugar, crushed red chillies and mix everything together. Keep aside. In a wok or deep non-stick skillet, heat some oil on medium high heat and add the chicken pieces, salt and pepper. Cook for a few minutes until golden brown. Add shallots, ginger, garlic and mix until fragrant. Add red peppers, green peppers, broccoli, carrots and stir fry for a few minutes. In the same wok, push everything on one side and in the remaining space, add the egg and scramble it. Mix it with the rest of the chicken and vegetables. Add the boiled noodles and pour the sauce on top. Mix everything together and let it cook for a few more minutes until the sauce thickens. DO NOT OVER-COOK or you will end up with a mushy mess. Squeeze half of a lime on top of the noddles and add more fish sauce if you like. Mix everything together. Garnish with peanuts, cilantro and limes. Enjoy! Leftovers can be stored in a sealed container in the fridge for up to 2 days and reheated in the microwave or stovetop. Are you sure about the 2/3 cup tamarind concentrate? Yes, I am but you can adjust it according to your preferences. OK, I made this with 2/3 c tamarind concentrate, and the dish was a dark black mess. Nothing like the photo on this page. Also too sour to eat. So what brand of tamarind concentrate are you using? Sorry it turned out to be a black mess. I use the Tamicon brand and order it from Amazon and mine has never turned out to be black.